Roca Foundation, "We are Water Foundation" is organizing a moving exhibition during 2012-2014 in Barcelona, Lisbon, London and Madrid exhibiting the Watercone® togheter with other innovations for the other 90% of the world`s popolation. International Aid & Trade fair from July 9-10, 2009 at the Ronald Reagan Building & International Trade Center in Washington D.C., USA. The International Aid & Trade is the world’s leading forum for humanitarian relief professionals to network, communicate, build partnerships and share knowledge. Please visit us at Stand 103 and see the Watercone® live. BMW Design Exhibition in Berlin and Munich, Germany from 4th February until 10th May 2008. More information will follow soon. ENTRY2006 will take place on the grounds of the world heritage site at Zollverein in Essen Germany, which used to be Europe’s largest mining facility. The focus of ENTRY2006 is on design, the motor of the creative sector and a competitive and innovative economic factor of the future. »Open House – Intelligent Living by Design« presents innovative and highly promising developments from the fields of architecture, interior design, and communication design. September 16, 2006—December 31, 2006. The Watercone® has now been selected to be part of the permanent collection of the MoMA NY. 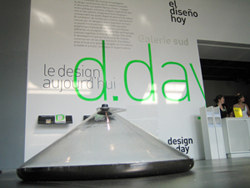 From June 29th 2005 - October 17th 2005 the Centre Pompidu in Paris presented the Watercone® in the exhibition D-DAY, modern-day design. View catalogue pages here as PDF file. 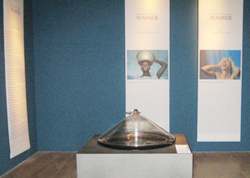 The Watercone® has now been selected to be part of the permanent collection of the Centre Pompidu in Paris. The Hypo Kunsthalle in Munich held an art exhibition with the theme "Mythos und Naturgewalt Wasser" form June 3rd until August 21st 2005. SOCIAL ENTREPRENEURSHIP on July 16th 2009 in New York during the WTN Summit. It is an honor to announce that the International Jury of the Energy Globe 2008 has judged the Watercone® submission as the national winner for Yemen. For this humanitarian and technological development Stephan Augustin received the "Energy Globe, World Award for Sustainability" on 26th May2008 at the European Parliament in Brussels with presence of Kofi Anan and Michael Gorbatschow and presented by Maneka Gandhi. 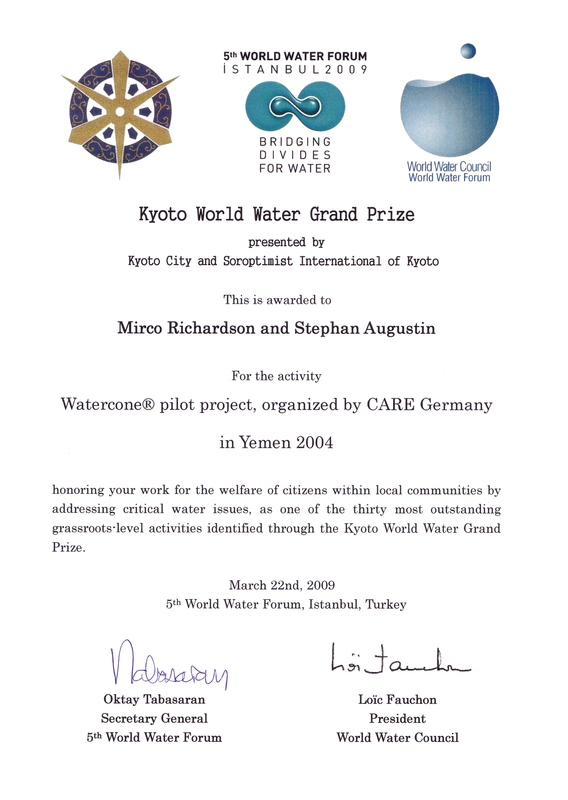 "Kyoto World Water Grand Prize"
The Watercone® has won the "Design Award of the Federal Republic of Germany 2004" with a recognition in Frankfurt, Germany on Friday 27th of August 2004. Pictures will be pubished soon. "The Watercone has been awarded an Honorable Mention in the Consumer Products category of this year's Annual Design Review 2004"
ID Magazine International Design Magazine, USA, has been published in I.D. ' s July/August 2004 issue. On September 17th 2003 the Watercone® received the "Materialica Design Award" in Munich, Germany for its outstanding concept and design and for the intelligent and innovative use of material. On October 30th 2003 the Watercone® received the "Good Design Award 2003 in Tokyo, Japan" and was nominated as one of the finalists for the "Ecology Award"
The IDEA Design Award organized by the IDSA is one of the most important Design Competitions for Industrial Products in the world. Sponsored by Businessweek the results of this years competition where published in the 07 July 2003 issue and in the Internet. The Watercone® received the Gold Award in the Consumer Products category. The Award Ceremony was on August 16th in New York. "The Watercone¨ is a highly innovative solution to one of the most basic needs in developing countries. The design developed by Augustin is one of the most compelling examples of design I have seen......It's beautifully simple, functional and intuitive. The Watercone¨ demonstrates how design can play a key role in improving the lives of many around the world." -Duncan Paul, I/IDSA, Global Design Leader of Fabric and Homecare, Procter and Gamble Eurocor NV. The year 2003 was announced as "The International Year of Freshwater" by the UNESCO. The aim of the year is to raise awareness of the importance of protecting and managing freshwater. For this reason we are proud to announce that the Watercone® was one of 150 finalists (more than 800 entries) invited to the 3rd World Water Forum`s "Water Action Contest" in Kyoto, Japan. It was an honour to be invited to such a significant event in the beautiful old imperial capital of Japan. Meeting such a great amount of Delegates from most countries of the world was instrumental in receiving professional feedback for future Watercone® endeavours. Pictures of this event can be seen here. The iF design award in Hannover, Germany is one of the best-known and most prestigious design contests in the world, also dubbed as the "Design Oscar" for industrial products. On March 12th 2003 the Watercone® received the Silver Award. It was the only award given by the jury in its category. The Watercone¨ received the "Kortrijk Xpo Award" at the "design for europe" competition in the category of "Survival Objects". The award ceremony took place in Kortrijk Belgium at Oct. 18th 2002. ©Augustin.net 2018 International Patents, "Watercone" an international registered trademark.